I have been asked quite a few times about this great photo and people say “Who are those guys and that woman with you”? Well, this shot was taken as Lovena and I was moving into this wonderful space in 1987 on Marshall Way in Scottsdale by Georgia Loloma. 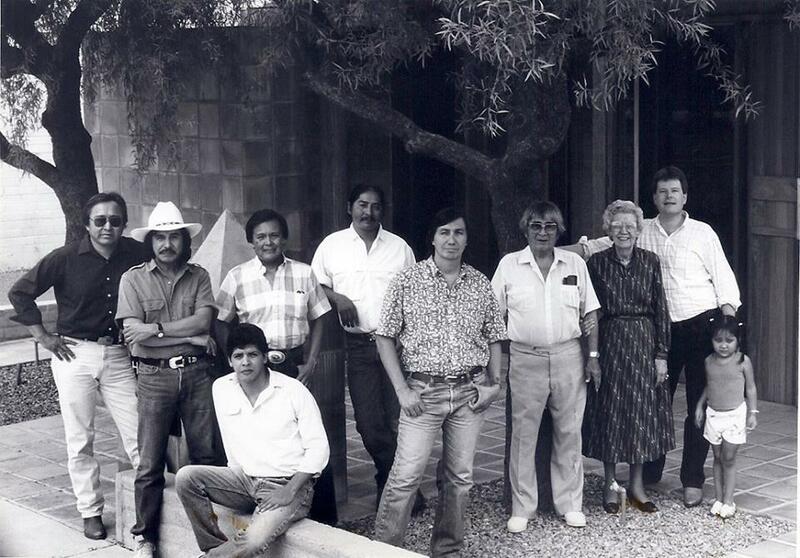 Painter, David Johns is to the far left, then; jeweler James Little, jeweler Harvey Begay, sand painter, Joe Ben Jr., jeweler Larry Golsh, Master Jeweler, painter, potter, Charles Loloma, My Great Aunt Lovena Ohl, the most incredible person ever and myself and next to me Shaliyah Ben, Joe’s daughter and last but not least is Charles Supplee, jeweler extraordinaire! Special times back then and even more to come as I get ready to celebrate 35 wonderful years this November in such a great business! Faust Gallery represents the finest examples of American Indian Art showcasing exceptional contemporary American Indian jewelry by the top artists working today. Beginning in the 1960s a handful of jewelers transformed what is known as “traditional jewelry” of the finest works of contemporary “wearable art” adored by collectors worldwide. The gallery was opened by Bill Faust in 1996. He became interested in American Indian art when he traveled to the Southwest in 1976 with his great-aunt Lovena Ohl. Lovena was a former buyer for the Heard Museum Gift Shop and then opened her own gallery in 1978. She was called the “doyenne of American Indian Art” by the New York Times. Under her tutelage, Bill established personal and long lasting relationships with artists and museums throughout the country. After she passed away Bill opened his own gallery space and continued her commitment to superior quality workmanship and materials in authentic American Indian Art. Today Bill looks for artists who create unique and multi-faceted work which stands the test of time. He looks back at his friendship and representation of noted Hopi jeweler Charles Loloma (1921–1991) which began in 1981. Loloma’s jewelry was “ahead of its time” with designs that remain cutting-edge thirty years later. It is this foundation of strength in design and quality that is sought out in each of the gallery artists. 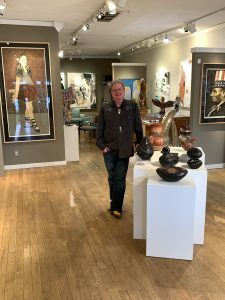 The gallery has represented other major jewelers including Harvey Begay, Larry Golsh, Charles Supplee, Donnie Supplee, Carl Clark, Ric Charlie and Sonwai (Verma Nequatewa). The work of each of these jewelers combines an inspired mastery of techniques, history, and pioneering artistry.